↑ 1.0 1.1 1.2 Národní knihovna České republiky: Výroční zpráva 2013. 2014. ISBN 978-80-7050-633-2. ↑ "Incunabula". www.nlp.cz. National Library of the Czech Republic. पहुँचतिथी 29 जून 2014. ↑ "Need for new library intensifies". The Prague Post. 28 मई 2008. पहुँचतिथी 16 जनवरी 2016. ↑ 4.0 4.1 "National Library's rare prints and manuscripts at the click of a mouse". Radio Prague. 24 November 2005. पहुँचतिथी 8 मई 2014. ↑ Tucker, Aviezer (18–24 फरवरी 2009). "Opinion" (PDF). The Prague Post. Prague. प. A4. पहुँचतिथी 16 जनवरी 2016. ↑ "National Library wins UNESCO award for pioneering digitisation work". Radio Prague. 7 September 2005. पहुँचतिथी 16 जनवरी 2016. 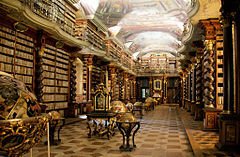 ↑ "2005 - The National Library of the Czech Republic". UNESCO. पहुँचतिथी 9 मई 2014.